Currently operating with 12 satellite campuses, the Church of the Highlands produces an annual Christmas production designed to bring the congregation together for an evening of song and celebration. With 11 performances scheduled for the production, Brian Worster, experience director, and Scott Waldrep, assistant production manager, were tasked with creating a worship environment to enhance the evening. An objective they achieved with 96 FLEXLite 3.9mm LED video tiles from Nashville-based PixelFLEX. 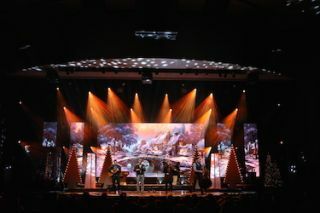 When Worster and Waldrep began planning the Christmas production, they really wanted the LED video wall to act as a focal point onstage that could highlight the musical performances, display pre-programmed video, and also serve as the backdrop while the pastor delivered his message to all in attendance. FLEXLite from PixelFLEX is an economical solution to traditional LED panels which can be installed and dismantled by one person, which made them will suited for the Church of the Highlands. With the Christmas production complete, Worster and Waldrep were also pleased with the support that came with them.